Fresh air with a walk in the woods is a great way to spend the day after Thanksgiving. We headed west. 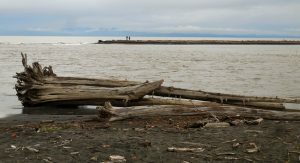 A couple of uphill hikes and another along the Elwha Dike Trail, watching the river rush to the strait, built up a powerful thirst. Good thing Washington State has an incredibly good winery in the neighborhood. Just west of Port Angeles is an artisan winery making award winning wines from eastern Washington State grapes. With engaging staff and dressed for the holidays, Harbinger Winery’s tasting room is warm and welcoming. For $5 you can stand at the bar or lounge around a table to enjoy the six wines on the tasting menu. For those of a different persuasion, Harbinger has Washington ciders and beers on tap, too. With homemade fudge on the shelf and cheese in the fridge, they have all the essentials covered. From Two Coyote Vineyard in the Rattlesnake Hills AVA, their 2015 Viognier is fermented in stainless steel. It’s crisp and floral perfect for creamed fish or chicken dishes. I remember tasting this at the Kitsap Wine Festival this past summer. It was a hot day, the wine was perfectly balanced. It was heaven with the seafood bite from Anthony’s. Another perfect shellfish or crustacean wine is Harbinger’s La Petite Fleur Washington White which is a blend of Chardonnay (43%), Pinot Gris (37%) and Riesling (20%). Again, 100% stainless steel fermentation which gives this wine wonderful white fruit flavors balanced with bright acidity. That acidity would also be a good foil to the drawn butter you’re dipping a freshly caught Dungeness crab in. This wine has won quite a few medals in previous years. Another multiple medal winner is the 2010 El Jefé a Rhone style blend of 62% Syrah, 25% Mourvedre, 13% Grenache. Rich with a touch of licorice, this guy is polished with age with a plummy, earthy way of expressing itself. A leg of lamb or even a warm bowl of lentil soup would have the angels singing. Barbera is an indigenous grape from the northwest – of Italy that is. This Barbera is from Columbia Valley’s renowned Sagemoor Vineyards, one of the state’s oldest. It’s a medium bodied, high acid wine with lots of concentrated red fruit flavors. It’s a natural with tomatoes, whether fresh dressed with balsamic vinegar, olive oil and Parmesan cheese or marinara. This is an award winning Washington State Barbera, a concentrated mouthful of crushed berries, and plums. The 2011 Sangiovese is from one of Washington’s highest vineyards in the Rattlesnake Hills AVA – Elephant Mountain. In Italy, this is the grape of Tuscany and regions such as Chianti and Montalcino. This wine is amazing not only because exhibits great acidity for a six year old wine but it has bright red fruit flavors and an earthy note with a long finish. It’s showing its maturity, throwing sediment. Cranberry Bliss is their festive wine made for that turkey sandwich with cranberry sauce. With bright fruit, and the buttery flavors of barrel-fermented Chardonnay and a douse of Syrah, this wine is delightful with picnic fare – cheese, crackers, a little smoked turkey and some dried cranberries. From Graysmarsh Farms in the Dungeness Valley is their source for the Blackberry Bliss. Because they use over 2½ pounds of blackberries to make one bottle, there is a mountain of blackberry goodness in that bottle. On the dryer side at 13% alcohol, it has the right amount of acidity and sweetness to be a refreshing quaff. The tasting room is open from 11:00 until 6:00 Monday thru Saturday, Sunday from 11:00 until 5:00p. As a result of limited production, Harbinger wines are exclusive to Northwest Washington but their wines can be shipped. 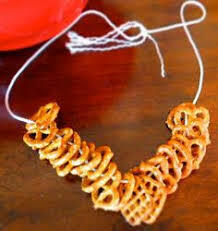 Call 360.452.4262 to place your order or do the virtual visit. But I would highly recommend a walk in the woods or the beach and then their warm and welcoming tasting room. Let the Wine Touring Weekend Begin! What to do this weekend? Tour a winery! 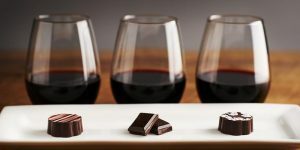 North, south, east or west there are many wineries ready to welcome you and your friends with food, music and wonderful wines. Go north to Bainbridge Island for a Memorial Weekend Charcuterie and Wine tasting. 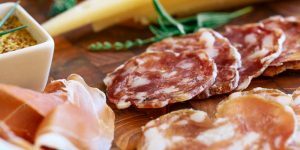 May 24 thru 26 the winemakers on Bainbridge Island serve up charcuterie (meat treats) to pair with their delightful wines. If you head south, stop by Mosquito Fleet Winery in Belfair. 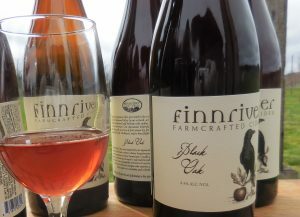 On Saturday only, from noon until 5p.m., Winemaker Brian Petersen will have a special spring barrel tasting. Dr. Brian Petersen will pour tastes of upcoming vintages still aging in the barrel. East of here is a plethora of wineries in charming Woodinville. Here’s a list of this weekend’s events. And a special shout out to Lou Facelli: Congratulations on 25 years! And finallly, west of here are the eight Olympic Peninsula Wineries and two cideries. They will be open but there are no special events planned this weekend. Here’s a map and list of the places to visit. Have a safe and happy weekend. Cheers! Harbinger Winery in Port Angeles was the recent recipient of a “Best of Show” award from the Portland Northwest Food & Wine Festival for its 2008 Syrah Vintner’s Pick. This sought after award is definitely something to write home about. Winemaker Sara Gagnon is clearly doing something right — the wine was recognized earlier this year with a double gold from the Seattle Wine Awards. 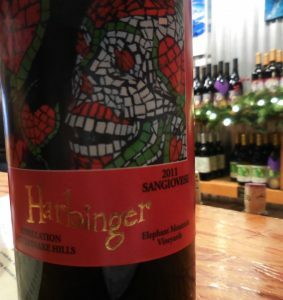 Harbinger also took silver medals for its 2009 Merlot and 2009 Bolero and recently was recognized by Sunset Magazine in its International Wine Compeition. The winery received gold medals for its 2008 Barbera and 2008 El Jefe’; a silver for its La Petite Fleur; and a bronze for its 2009 Bolero. “I am so happy to see Harbinger competing so well at an international level. The downside of this is the fact that we are small and our wines very limited. Both the Barbera and El Jefe’ are all but sold out! 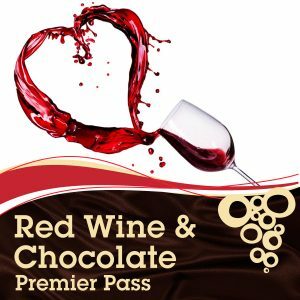 So I guess this will just have to be validation to all of the folks that already purchased these wines,” Gagnon said. A limited tasting and release of the awarding-winning wines will be available at Harbinger’s Holiday Open House on Dec. 8 from 11 a.m. to 7 p.m. 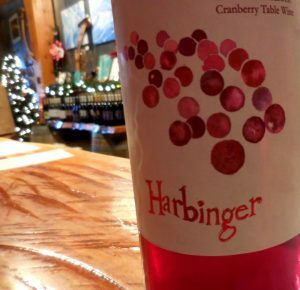 In addition to the award-winners, Harbinger will also have samples of its holiday wine and “four-legged-friend-wine” — a blend where 100 percent of the profits go to the Olympic Peninsula Humane Society. Harbinger Winery is located at 2358 Highway 101 West, just 3 miles west of Port Angeles. The tasting room is open daily from 11 a.m. to 6 p.m. and Sundays, 11 a.m. to 5 p.m. For questions or more information call the Harbinger Tasting Room at 360-452-4262 or visit at www.harbingerwinery.com. 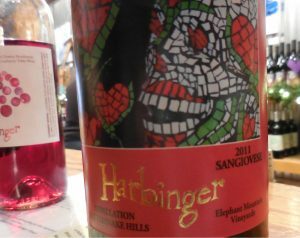 Harbinger 2008 Sieg-MA is a delightful blend of two German grape varieties — Siegerrebe and Madeleine Angevine — grown in the Puget Sound Appellation. Harbinger Winery is located in Port Angeles and it’s a brewery too! The wine is very aromatic with a bouquet of flowers and spice. At 10.6 percent alcohol, it is sweet but the acidity keeps it clean and crisp. Gagnon’s description of the wine, a “balance of fruit and acids that leave you feeling as invigorated as a glacially fed river plunge”, is a perfect imagery. This wine pairs beautifully with spicy Thai or Chinese and fresh fruits and sharp cheddar.